Built for superior fall protection reliability and time aloft climbing comfort - this kit has it all. We designed this professional tower climbing safety kit for climbing wind energy towers, cell towers and other safety at height sites with fixed cable ladders. We carefully chose the ExoFit six D-ring harness from DBI-Sala for its superb safety, comfort and meeting all OSHA and ANSI standards. The ExoFit Tower Climbing Harness also features a removable padded seat, and front D-ring to attach to the included wire rope cable grab. 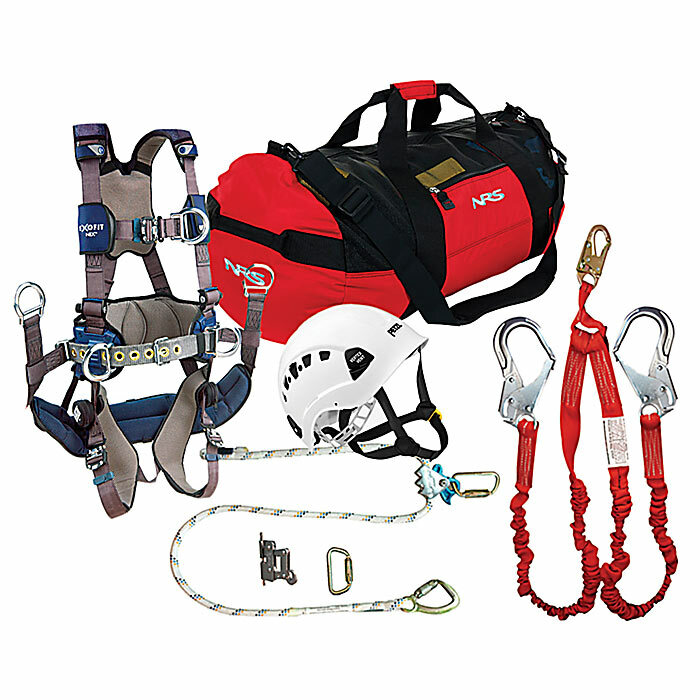 A 6-foot positioning lanyard and Petzl Vertex Vent 2 climbing helmet ensure climbing safety and, once up the tower, you'll have a 2-leg shock-absorbing lanyard from Elk River to provide 100% tie-off. Everything in the kit fits neatly into the red nylon mesh duffel bag. DBI/Sala ExoFit Tower Climbing Harness - Comfortable, adjustable, and built for tower climbing.